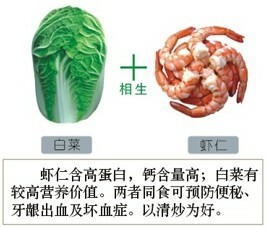 Welcome to the fourth article based on the Xiangsheng Xiangke food chart that I posted in the “Foods that React to Each other“. Today we continue to cover combinations of food that are naturally healthy on their own, but Chinese traditions (and TCM) suggest they react to each other in various ways. Let’s start with a meat and vegetable combination. 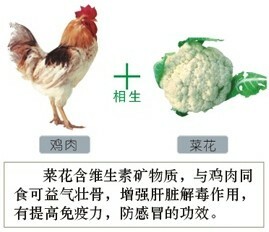 + “Cauliflower has vitamins and minerals, and when eaten with chicken it can make stronger bones. Combined they also improve the detoxing power of your liver and give your immune system a boost. With that you will fight colds much more easily.” Perhaps a little cauliflower in the traditional Chicken Noodle soup recipe would help. 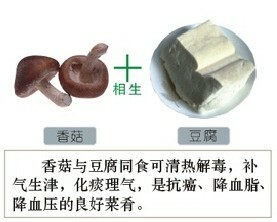 Welcome to the second article based on the Xiangsheng Xiangke food chart that I posted in the “Foods that React to Each other“. Today we continue to cover combinations of food that are naturally healthy on their own, but Chinese traditions (and TCM) suggest they react to each other in various ways. Let’s start with a positive combination. 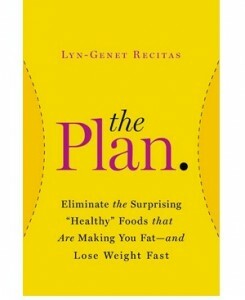 An American friend recently introduced a book to me that is gaining popularity in the US called, The Plan. It describes in detail that certain healthy foods we eat regularly do, in fact, cause us to gain weight. The author uses concepts that are regularly used in Chinese discussions of health and makes them accessible to a Western audience. “Inflammatory foods” cause “inflammation”, which produce negative effects on your body and can effect weight gain and loss.